With the goal of constructing robust, resilient and secure educational facilities, ASSA ABLOY partnered with School Guard Glass to develop complete door openings that comply with the 5-aa10 test standards based on the FBI’s Active Shooter Report. The openings are designed using hollow metal door and frame construction with accompanying ASSA ABLOY hardware, that ensure maximum security without sacrificing usability or aesthetics. To ensure that doors remain secure once closed, the Attack Resistant Openings are rigorously tested to ensure they can withstand an intense four-minute physical attack with the use of hand tools after being shot 60 times with 7.62 NATO rounds. 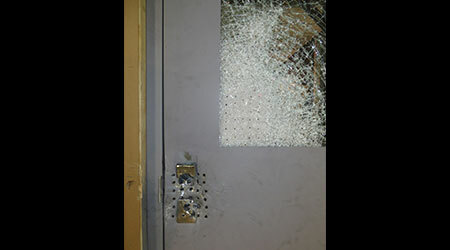 And while the door or glass may not stop a bullet from penetrating the opening, the attack-resistant door assembly will remain intact, preventing an attacker from breaching the opening.